A thick haze would eclipse the sun throughout the day from late October to early November,” says Naresh Kumar of Puthar village in Haryana’s Panipat district. Sitting beside neatly piled up paddy straw in his small 0.2 hectare field, the 40-year-old farmer is reminiscing about the common practice of burning straw to clear fields. “Since the past two or three years, the haze does not envelop the sky because we do not burn straw anymore. We use it to grow mushroom and make money,” he says. Kumar is among the many farmers of Israne block of Haryana’s Panipat district who have started farming mushrooms using paddy straw for preparing the compost needed to grow them. This has nearly ended the practice of burning crop stubble in the block. The problem of pollution caused by burning of straws in the agricultural states of Punjab and Haryana was so severe that in 2012 the US’ National Aeronautics and Space Administration released a satellite image showing fires across millions of hectares of agricultural fields in the region. The smog and haze it caused even affected Delhi situated 100 km south. There were local concerns as well. “The burning of straw heated land and killed soil microorganisms, harming its productivity,” says Kavita, a farmer from Puthar, adding that now farmers not only use paddy straw in mushroom farming, they also sell it to farmers in the adjoining state of Uttar Pradesh. Indravati, a 60-year-old farmer of Israne, says the smog would cause her breathing problems. “But I have been feeling better since the past two years,” she adds. “Israne has 17,600 hectares (ha) of paddy fields and estimates show one hectare of paddy produces 2.6 tonnes of straw,” says Rajendra Singh, agriculture officer of Israne. “Mushroom farming has ensured that Israne has stopped burning about 46,000 tonnes of paddy straw a year,” Singh calculates. Today more than 20 marginal farmers run over 100 mushroom farms in Israne. 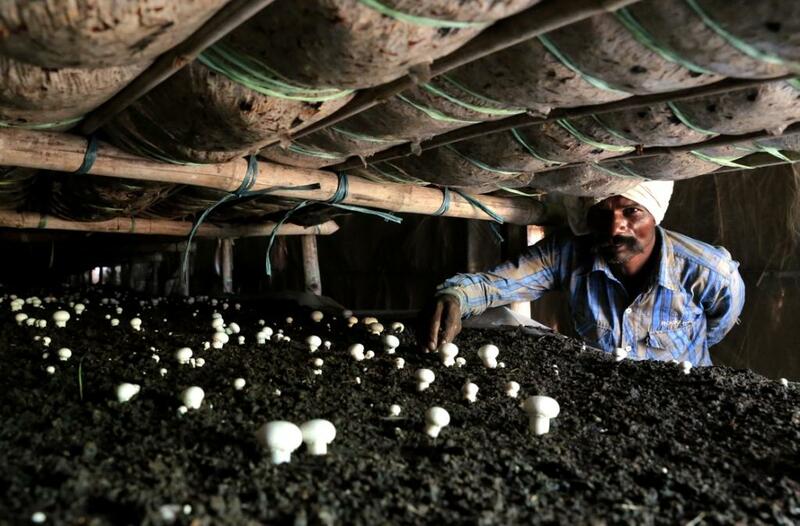 “The total annual turnover from mushroom farming in Puthar is over Rs 2 crore,” says Rajendra Singh. It is difficult to say if checking pollution was the reason farmers started using paddy straw in mushroom farming. Livelihood and economic problems may have been the key factors. Farmers earlier used wheat straw for making compost, but that was turning out to be very expensive. “Paddy straw from a 0.4 ha paddy farm costs only about Rs 1,000. It is nine times cheaper than wheat straw,” explains Kumar. “A small farm of 0.12 ha needs five tonnes of paddy to grow mushrooms,” adds Kumar. “I learnt about the use of rice straw from relatives in Khubru in Sonipat district. The government supported us by providing loans on easy terms,” says Ashok Singh, a farmer from Puthar. Satpal Singh, Ashok’s brother, was the first to experiment with paddy straw in the village. “There was no difference in productivity. So about two years ago, we replaced wheat straw with rice straw,” he says. “Wheat straw is expensive because of its demand from brick kilns where it is used as a fuel. People also used it as fodder because it is more nutritious than paddy,” Ashok adds. The main reason farmers were burning their field stubble was the lack of options to dispose of the straw. The easiest way was to burn it. The government had recommended that farmers should take it to the nearest biomass plant. But transporting it was costly, particularly in cases where biomass plants were not close to the village. The problem worsened with mechanisation of agriculture. When paddy is harvested by machines, only the rice grains get plucked and long stumps of the crop are left rooted. “In our hurry to prepare the field for the rabi crop, we would just burn the straw,” says Jitendra Singh, a big landholder from Puthar. But when harvesting is done manually, the crop is hacked almost from its base, removing the need to burn the stumps. Machine harvesting also damages the rice grain, reducing its market value. “Rice harvested by machines gets Rs 400 to Rs 800 less in the market compared to rice harvested manually. Although using labour to cut paddy straw delays the process of wheat plantation, we are trying to deal with the problem by encouraging farmers to cultivate late season varieties of wheat,” says Jitendra. These problems associated with mechanisation made farmers revert to manual harvesting. This caused a considerable decline in the practice of burning paddy stubble. The government, however, is unaware of this transformation. When contacted, Brijendra Singh, secretary and director general of agriculture, Haryana, said he would ask his colleagues to study the initiative. Suresh Gahlawat, additional director general, department of agriculture, was also surprised. “We are not aware of such practices but we always encourage farmers not to burn paddy straw,” he said. 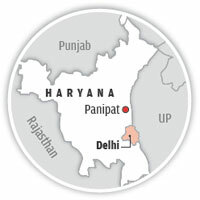 Both Haryana and Punjab have enacted laws to stop burning paddy straw. But they have been ineffective. “We avoid booking farmers. It would not help solve the problem,” says Gahlawat. Use of paddy straw in mushroom farming and the reduction of mechanised harvesting are bound to bring relief to officials like him. Good initiative to contain air pollution and increase farm income. Inspiration to many farmers who cultivate paddy. Livelihood concept definitely attract more number of farmers to cultivate mushrooms using paddy straw. Paddy waste of nabouring capital of INDIA was recently created problem for India's capital.Now think for mushroom production out of the Paddy waste.